Happy Nails, Sarah Van Mai have created an artistic team of knowledgeable and experienced individuals in a wide range of nail services.We strive to maintain the highest level of customer satisfaction, professionalism. Education, a commitment to creativity, and individualism are at the center of our constant pursuit for excellence. Happy Nails provides the best services day to day by meeting the demands of our customers and proving our ability to produce the highest quality work. we use are the best and have high quality and most trusted manufacturers in the beauty industry. Besides, We understand sanitary and safety is one of clients’ top concerns, so we try our best to guarantee clients’ health. All of instruments always disinfected right after each use with the most effective methods. We are pleased to extend various offers to our clients through this site, Facebook …, We will also keep you updated with added services, discounts. 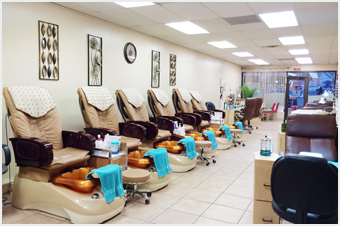 At Happy Nails – Your relaxing time would become enjoyable than ever !